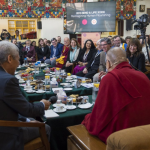 “Compassion Matters is an educational outreach project from the Dalai Lama Centre for Compassion aiming to support the teaching of secular ethics and moral philosophy in primary schools and youth organisations working with 10-12-year-olds. In 2017-18, we piloted our first three modules with three schools including our development partner, the Dragon School, Oxford. We were delighted with the impact that our learning resources had on the children, teachers, parents and the wider school community. You can find more information about the projects impact and pilot in other sections of the website. Our educational resources comprise five modules on compassion and related values. Each module begins with an engaging short film which tells the story of an individual who embodies the values of the theme of the course. The films serve as the introduction to each topic and are produced to high production standards by an award-winning filmmaker. Our learning resources for primary schools are accessible, exciting and transformative in their impact. Teachers can download the resources and use them in their schools as part of their PHSE well-beingm, R.E. or as part of a cross-curricular project.